New book, 141 pages. Technical artist and military historian George Bradford has been producing detailed drawings of armored fighting vehicles for over thirty years, now a lifetime of work has been collected into one publication, featuring multiple 1/35, 1/72 or 1/48 scale drawings of an amazing 153 Cold War Armored Fighting Vehicles from 1945-1990. 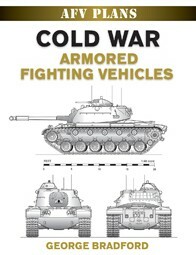 With every vehicle displayed in a 4 or 5 view plan, and created using vector based drawing applications, this series of books is the complete scale modellers guide to Cold War armored vehicles.